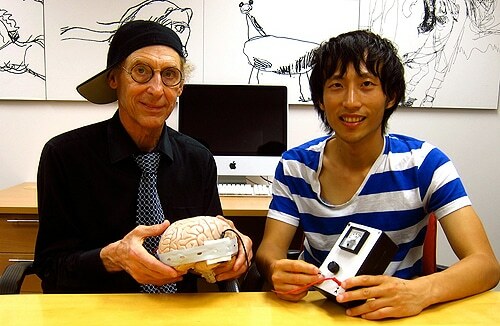 (L-R) Professor Allan Snyder and Richard Chi found brain stimulation helped people solve a puzzle. Brain stimulation can markedly improve people's ability to solve highly complex problems, a recent University of Sydney study suggests. The findings by Professor Allan Snyder and Richard Chi, from the University of Sydney, are published in Neuroscience Letters. "The results suggest non-invasive brain stimulation could assist people in solving tasks that appear straightforward but are inherently difficult," said Professor Snyder. Our minds have evolved to solve certain problems effortlessly, yet we struggle to solve others that appear simple but require us to apply an unfamiliar paradigm, to 'think outside the box'. "As an example we have taken the famous nine dots problem, where you are asked to join all the dots with four straight lines without taking the pen off the page," Professor Snyder said. 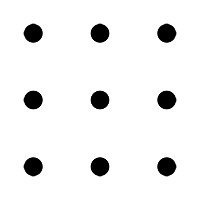 The famous 'nine dots puzzle'. Can you join them using only four straight lines without taking your pen off the page? "Surprisingly, investigations over the last century show that almost no one can do this." Now the researchers have shown that more than 40 percent of the people they tested were able to solve the nine dots problem after receiving 10 minutes of safe, non-invasive brain stimulation. Specifically the left anterior temporal lobe of the brain is inhibited while simultaneously the right anterior temporal lobe is excited, employing a technique known as transcranial direct current stimulation. Using the same procedure the researchers have previously reported success in amplifying insight and memory. Chi and Snyder suggest that their unique brain stimulation protocol could ultimately enable people to "escape the tricks our minds impose on us," as Professor Snyder describes it, and solve tasks that appear deceptively simple.